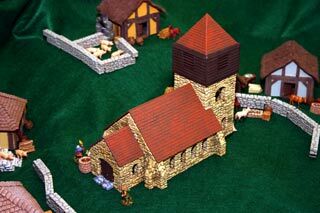 This article describes the design and construction of a 25mm (1/64th) scale miniature model Saxon Church. 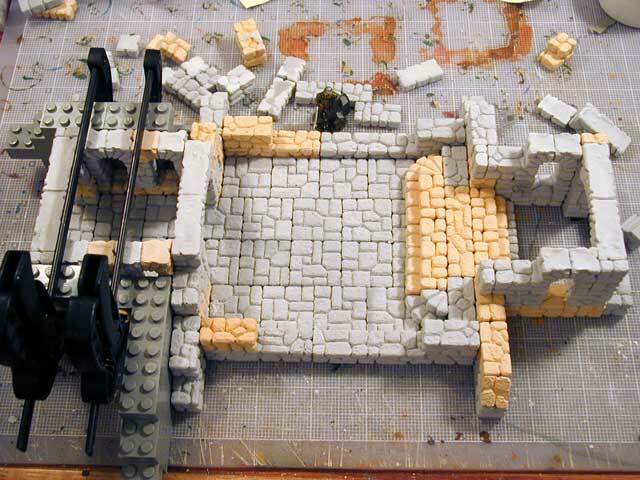 The model is constructed using plaster blocks cast from Hirst Arts silicone molds, primarily the Fieldstone Wall mold (#70) and the Flagstone Floor Tile mold (#260). 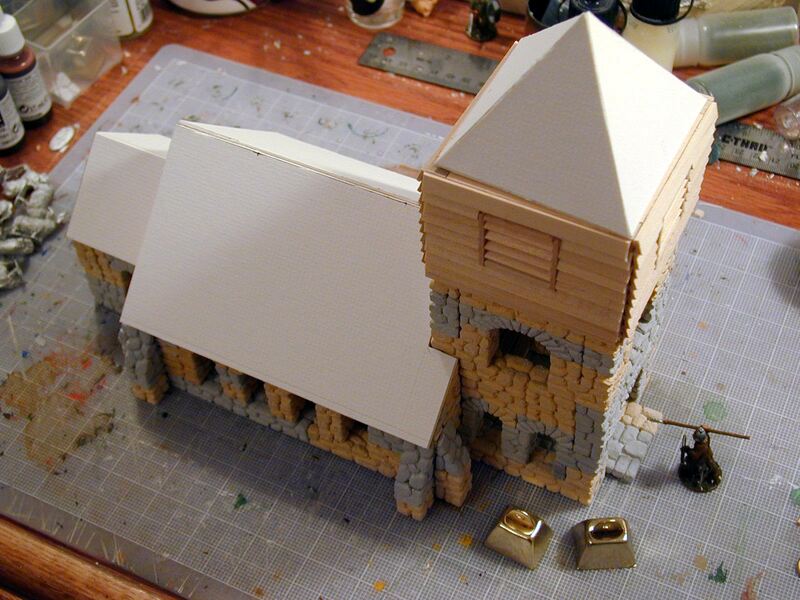 The rest of the model is constructed from bass wood, card stock, and various hobby materials. The model is painted with latex and acrylic paints and sealed with matte varnish so it can be used in a variety of miniatures games, in dioramas, or as a decorative piece. Saxons were inhabitants of southern England and the northern German region of Saxony. They flourished after the decline of the Roman Empire in Britain (400 A.D.) and declined after the Norman invasion of Britain in 1066 A.D.. The most famous king was King Alfred who established many towns, promoted trade, established laws, and fought the Danes. Much of his work is still evident in England today not only in Saxon architecture, but in the layout of roads, estates, and towns. Here is a rear view of a typical Saxon parish church in the middle of a small town. Fortified towns known as burghs were often established by the king as a way to protect the people and a means to raise an army. Each town was governed by an upper class lord known as a thegn. The thegn had a manor and an estate and employed many people of the town. The thegn also built the town church and had the right to appoint the minister, or even dismantle the church if he pleased. Eventually larger teaching churches known as minsters and cathedrals came as the organization of the church expanded, but the small churches came first. Long before the towering gothic churches of the Middle Ages, the Saxon churches were serving the towns and the people of the Dark Ages. Surrounding the church in this photo are the homes of the villagers. 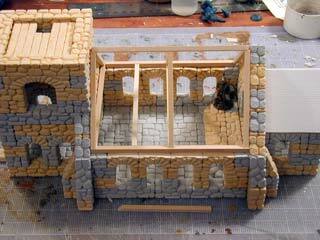 These wattle and daub building models were also built with Hirst Arts molds and various hobby materials. The buildings are made with a cross section of an orange juice cartons. Planks from the Wooden Plank mold (#260) are glued to the cartons. Then a bit of spackle is pasted to the carton to give it some texture. 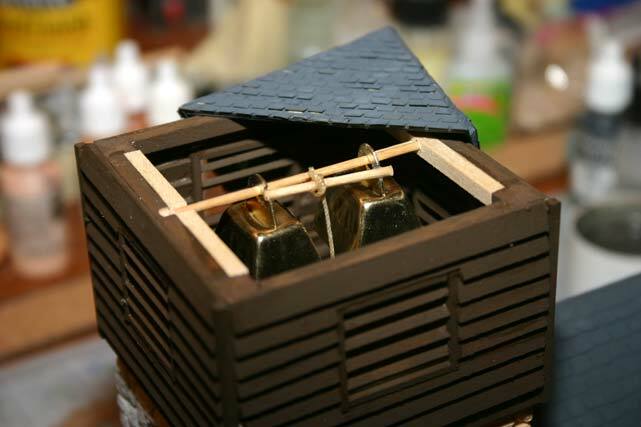 The roof is made with matte board (the heavy cardboard used in picture frames), and the roof thatch is made with fur material from the local fabric store. Some of the buildings in the foreground have wood shake roofs made from Hirst Arts Wooden Shingle mold (#240). All the buildings are painted with latex and acrylic paints to give the village a hodge-podge of color. Walls are made with pieces from the Fieldstone Wall mold. Farm animals are the 25 cent type for kids found at toy stores. 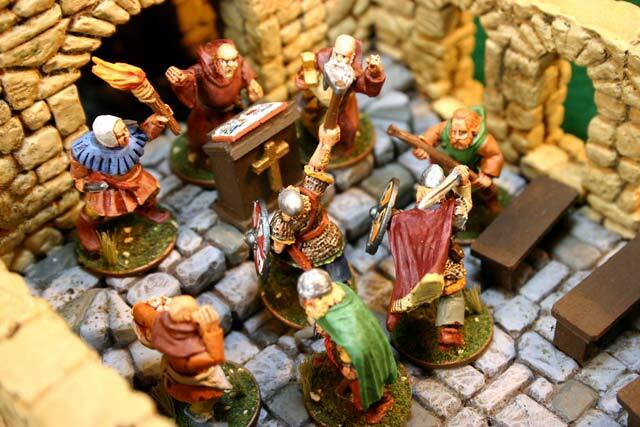 You can never have too many rubber pigs for Dark Ages miniature gaming. Here is St. John's Church a parish church in the village of Farley Chamberlayne (Farley means "meadow over the way" in Anglo-Saxon) west of Hursley, near the city of Winchester, in Hampshire England. In 2001 I often went running by this church and was struck by its wooden bell tower, its squat appearance, and its mossy covered roof and yellow walls. Although this is really Norman architecture (12th century) sitting on the site of an older wooden Saxon church, I still like the asymmetrical buttresses and envision them as makeshift appendages holding up the crumbling ancient walls. Also note that parts of the wall are in stone, and other parts are in yellow stucco. It could be that the stone corner is the original masonry and the stucco is a renovated portion. Or it could be the stucco has fallen away from the corner revealing the original stone beneath. 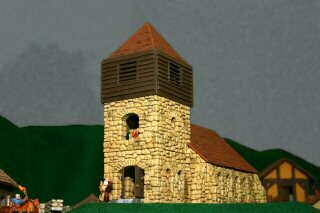 In either case, this church struck my fancy, and I knew I had to make a model based on these features. Here are the preliminary design sketches I made for my model church. You can see that I definitely wanted to have a wooden bell tower and some buttresses. Every miniatures gaming church needs a bell tower! How else are the villagers to call the farmers in to come and fight. Also, I wanted a big simple nave, a large room where the villagers can meet and decide how to defend themselves from the Danish invaders. I also made the tower separate from the main part of the church. This is basically a concession to make the model easier to build and dismantle. The design also called for small wooden entryways, one of them at the side. 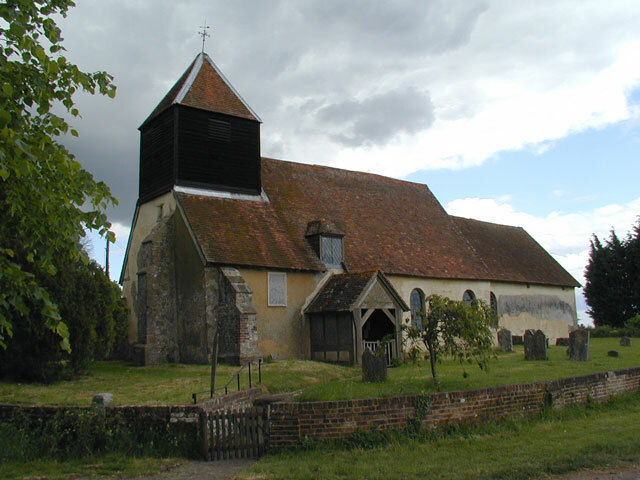 Most Saxon parish churches did not have furniture or a longitudinal aisles. Many of them, including this church at Hursley have a simple side entry. I made a small change of plan and included a somewhat grand (by Saxon standards) front door. 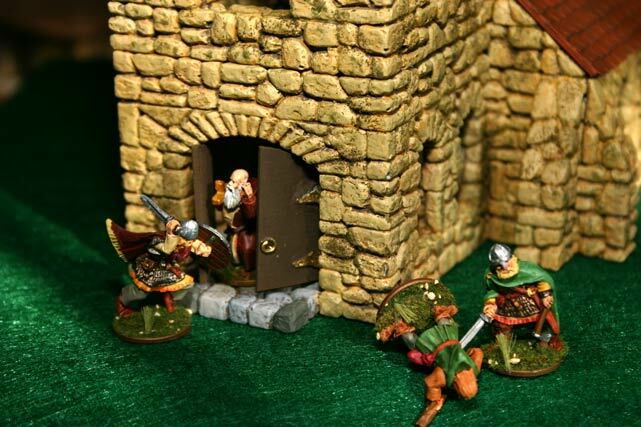 One of my goals was to make a nice focal point for miniatures gaming, so I wanted to have a big door that the villagers could barricade and Vikings could knock down. This photo shows the beginning of the construction of the model church. First I layed out a floor plan using 1 inch Flagstone Floor Tile mold. There is a small vestibule on the left side that will form the bell tower. The vestibule is surrounded by Lego plastic building blocks which are excellent forms for guiding the Hirst blocks into squared, vertical walls. I also use a pair of bar clamps the hold the church walls to the Lego forms. On the left side of the photo, we see another vestibule which forms the chancel for the priest. It's only a small room, but perhaps here is where the priest will store the treasures of the church. Additionally there is a raised platform for the church altar or a lecturn. 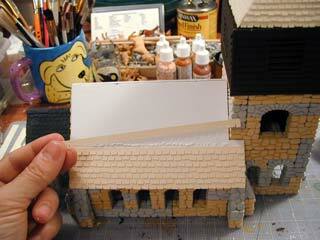 To assemble the model, I use ordinary Elmer's Tacky Glue, which is a bit thicker than Elmer's White Household Glue. The nice thing about the sticky glue is that is really holds the pieces together well. Also, if you make a construction error, you can soak the blocks in water and they will come apart. Once you paint the model, the glue is encased so that is relatively water proof. Still I don't know how well these models will hold up outdoors in the rain in the garden. In that case you might want to use an epoxy based glue such as Liquid Nails brand. A 25mm figure oversees the work and helps denote the scale of the model. This photo shows the completed walls. I opted for quite a few arched windows in the church: 4 on each side of the nave, multiple arches on each side of the tower, and a few around the chancel. This is more than historically necessary, but is more fun from a gaming perspective (more windows for archers to shoot from). Also, note that Saxon arches were typically triangular shaped. The rounded arch is known as Romanesque, but the Saxons used them also, having learned a few things from their Romano-British predecessors. My bricks are made of both gray and beige plaster. As the entire model is soaked in dark primer paint, the underlying color of the plaster does not matter. Now the roof goes in. I made the frame of the roof with bass wood. The frame is covered with matte board, the heavy cardboard that is used in picture frames. The frame is not glued to the walls in order to make a removable roof so that you can place figures in there and have a big battle. Also notice that the second floor of the bell tower has been completed. They are made with some spare planks of the Wooden Plank mold. Of course there is a hole in the floor to allow the bell ringers to climb and descend. 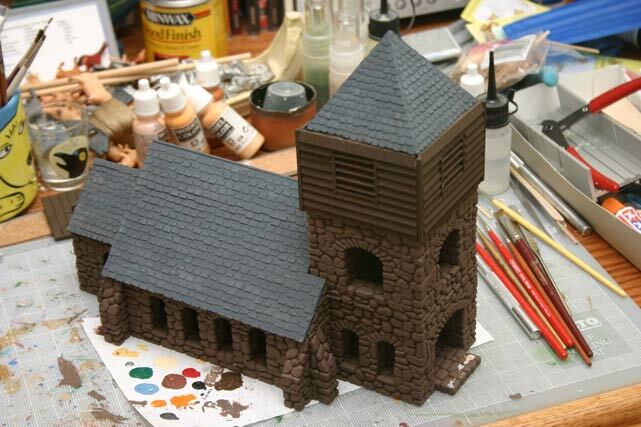 The floors of the bell tower are removable in order to make the structure easier to paint. This photo shows the completed matte board roof and the bass wood bell house. From the photo of the Hursley Church, the bell house appears to be a cube of wood, with plank shingles, and small vented windows, probably to allow the sound to escape. 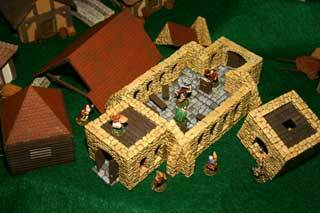 Many Saxon structures were entirely made of wood, and very few of these wooden structures survive today. I imagine any bell house such as this had to be rebuilt every hundred years. Some hobby material manufacturers such as Midwest Products or Northeastern Scale Lumber Company actually make milled plank sheets so that this cubic bell house could be made with four square sheets. However, as most scale lumber is designed for HO scale, I could not find the size planking I wanted and had to build the planks by hand. The window vents were also hand constructed. It was a tedious task, but it makes the bell house look very rustic. As with the stone tower, the bell house is not glued to the tower in order to make it removable and easily paintable. This photo shows the making of shingles for the church. Although Bruce Hirst makes a Gothic Roof mold with slate tiles, the tiles looked too grand for this village church. The Hirst tiles look more at home on a cathedral. 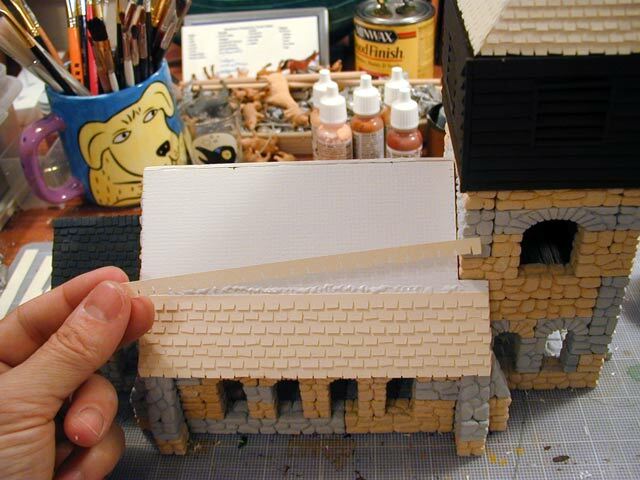 Some of the hobby material manufacturers make scale roofing. However, I just didn't find anything close to what I wanted. So I decided to use manila folder paper and hand cut smaller tiles. Each tile strip is about 3/8" (9mm) deep, and each tile cut is about 1/4" (6mm) wide. This roof was especially tedious to make, but I think the final result looks very close to the Hursley Church. This photo shows the model with its first coat of paint. The stones are primed using ordinary dark brown latex paint from the hardware store, thinned with water. You have to use an especially thin mix in order to make the paint flow into all the cracks in the field stone bricks. The roof is primed with gray acrylic paint. Priming with spray paints is troublesome. There are so many cracks, it is very difficult to angle a spray to ensure that the entire model is coated. I prefer a big, medium-stiffness brush and lots of thin cheap paint. Notice the messy hobby desk. Space and time are at a premium here. I often do not finish one project before beginning another. One day I hope to get that Viking ship in the background all done, and you'll be sure to read about it here at this site. And now those of you who have read this far, get to see one of the special features of this project: working church bells (8 second duration, 100kB MP3 file). If you have seen some of my other models such as the Campanile dice tower, you know I like to put special features in them. Bells seemed to be a fun idea, a means for villagers to call their fellow peasants into the village, a call to arms, a cry for help. The photo shows how the bells are constructed. Inside the bell house there is a round cross bar that axis as the axle on which the bells swing. On the cross bar hang two brass bells that one can purchase at a craft store such as Michael's or Hobby Lobby. I cut a notch into the hanger of each bell and in the notch I glue a second cross bar with a rope attached to it. Since the second cross bar is off the rotating axis of the main cross bar, pulling on the rope causes the bells to swing and ring out the glorious chimes. Of course, most Brits are fond of ringing changes, but you will find it hard to replicate that endeavor with this model. As you see, it all comes apart to place figures and other hidden treasure inside. But wait! What's this? The Vikings are invading. To arms, the Vikings come! Aye, they've killed Herman the Woodsman with one stroke of the broadsword. It's clear that these heathens can't be bought off. Quick, brother Maynard, close the door. One of those beasts is trying to get in. Aiieee! They've entered the nave. Pretty soon their swords will enter the knave. "Out of this Holy abode!" shouts Brother Ignats at a wooden lecturn made with scrap bits of bass wood painted brown. "In the name of Lord and by the word of this bible," constructed from two chips of bass wood and painted to resemble an illuminated manuscript, "leave this house now." Pandemonium breaks loose as the big melee unfolds in this once peaceful Saxon Church. 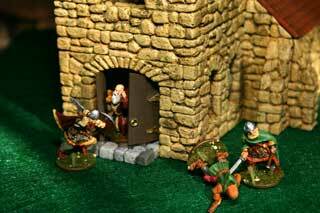 Check back to this site for more miniatures gaming and modelling-related material. Thanks go to Andrew Johnson for many great web links and historical fact checking for this article. Last modified: Thursday, 09-Jun-2011 12:39:20 MST.